WASHINGTON, July 11, 2016 – Agriculture Secretary Tom Vilsack today announced funding for 821 projects across the nation that will help rural small businesses and agricultural producers reduce energy usage and costs in their operations. The funding is available through the Rural Energy for America Program (REAP) and will be used to make energy efficiency improvements and install renewable energy systems. Delaney’s Landscape Center, a family-owned business providing plants and landscaping services in Polson, Mont., has been selected to receive a $10,298 REAP grant to install a geothermal renewable energy system to heat its greenhouse. The system is expected to save the business nearly $2,000 per year and generate more than 15,000 kWh of energy. The project also supports USDA’s StrikeForce for Rural Growth and Opportunity by investing in a high-poverty area. The Sundry Store, Inc., another family-owned business, providing home improvement tools and household items, is receiving a $15,565 REAP grant to replace its fluorescent- and incandescent-based lighting system with a light-emitting diode (LED) system. The new system is expected to save the Etowah, Tenn., business $13,676 annually and reduce energy usage by 136,766 kWh annually. That is enough energy to power 13 homes. 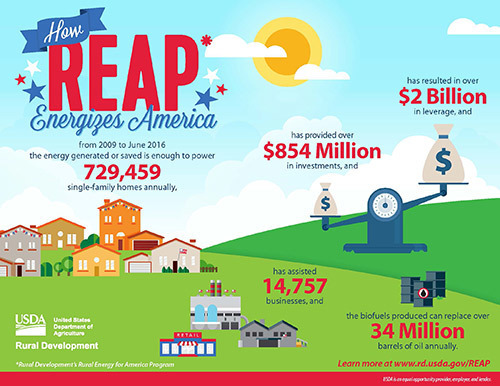 From 2009 to date, REAP has helped finance more than 11,000 renewable energy and energy efficiency projects that have reduced energy costs for roughly 15,000 rural businesses. During this period, USDA has provided more than $373 million in grants and almost $481 million in loan guarantees to agricultural producers and rural small business owners. When operational, these projects will generate or save almost 9 million megawatt hours – enough to power more than 730,000 homes and reduce greenhouse gas emissions by more 5 million metric tons in carbon dioxide each year. That is the equivalent of removing more than 1.1 million cars from our roads. The Rural Energy for America Program also helps businesses create jobs, helps farmers and rural businesses reduce their carbon footprint, and helps the country move closer to energy independence. REAP is generating positive results. Silverleaf Family Farms, LLC, of Corrales, N.M., used a $4,522 REAP grant in 2014 to install a 6.1 kW photovoltaic array system. The system generates about 10,600 kWh per a year, replacing 33 percent of the farm’s energy usage. The savings have allowed the owners to reinvest in their hydroponic vegetables business. Silverleaf subsequently received a $44,068 USDA Value Added Producer Grant to expand vegetable sales into additional farmers’ markets and grocery stores. Helping thousands of rural small businesses, farmers and ranchers shift away from fossil-based energy by installing renewable energy systems and energy efficiency solutions has been one of the most important components of USDA’s climate mitigation investments. Thanks to USDA investments in renewable energy projects of all sizes, rural Americans are saving more than 10.4 billion kWh— enough energy to power more than 959,000 American homes annually.